The fast-growing online furniture seller is failing to keep its costs in check. Shares of online furniture retailer Wayfair (NYSE:W) dropped 11.5% in August, according to data provided by S&P Global Market Intelligence. The company's second-quarter report was mixed, with costs rising faster than sales, a development that led investors to erase the stock's earlier gains. Wayfair grew revenue by 60% year over year to $786.9 million during the second quarter, driven by a 65% increase in active customers and a 15% increase in average order value. Analysts expected revenue to be about $4.5 million lower. While Wayfair beat expectations on revenue, profitability was another story. The company reported a non-GAAP (generally accepted accounting principles) net loss of $0.43 per share, compared to a loss of $0.15 per share during the prior-year period, and $0.02 lower than the average analyst estimate. The miss was driven by a 69% year-over-year increase in operating expenses, with merchandising, marketing, and sales costs rising 82%. We look forward to building on our success in the United States and our investments in Europe and Canada, and remain very enthusiastic about our long term growth and profit potential. Wayfair's market capitalization now sits at roughly $3.3 billion, about the same as the average analyst estimate for revenue in fiscal 2016. That valuation suggests investors aren't very confident that Wayfair can continue to grow rapidly and become profitable at the same time. Wayfair continues to spend heavily in order to gain more customers, but with customer loyalty a fickle concept, it's unclear whether this spending will pay off in the long run. Wayfair spent 12% of revenue on advertising during the second quarter, a number that will need to come down if the company hopes to eventually turn a profit. 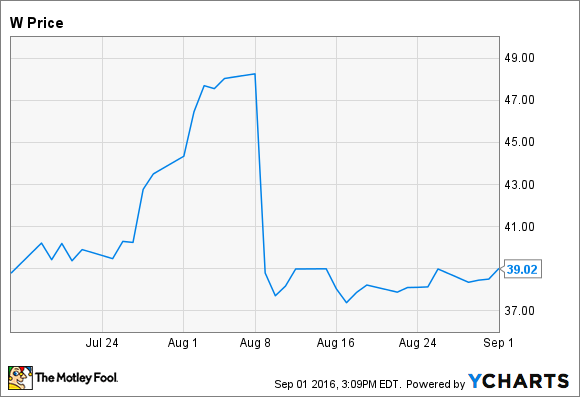 Despite continued growth, a lack of progress toward profitability was enough to send Wayfair stock tumbling in August.